As you approach the end of your college career, it’s probably becoming more and more of a reality to you that your familiar cocoon environment of college is slowly but surely fading away. On the flip side, while you’re certainly taking a plunge by graduating and looking for your first job, all this new change is exciting, and it’s quite exciting to be standing on the edge of the rest of your life. Job searching can feel like a job in and of itself, and oftentimes, students don’t properly prepare themselves for the rigorous process of applying for a myriad of positions. A certain set of prerequisite skills are often required before some HR departments will give your resume a second glance, and there is an art to writing a good cover letter. Read the list below for a few helpful hints on how to maximize your potential as you job hunt. Most colleges and universities have an entire department devoted to helping you prep for finding the right career. Not only can they help you get started with job searching and show you the best places to look for the jobs you’re interested in, but they can also help you prep your resume, advise you on your portfolio, and help you learn the best tips for interviewing. The best part about career services is that they are usually free! If you haven’t graduated yet, it’s a good idea to swing by your university’s career development office and at the very least, grab a few brochures or other resources and chat with a career development staff member to find out if their services would be a good fit for you. It’s really helpful to be able to sit down with someone and have some focused attention on what you’re interested in and what might be the right career for you. You know what they always say: it’s not what you know, it’s who you know. This is most certainly true when it comes to looking for a job. Many workplaces get hundreds of applications after they post for a certain position, so having a friend in the business can really help. If you happen to know a fellow student who got a job somewhere you’re hoping to work, it’s a good idea to reach out and see if they would be willing to mention your name to the HR department, their supervisor, or another relevant party. What skills are necessary for your position? What would make an ideal candidate for a workplace like yours? It’s a good idea to be upfront with whoever you’re interviewing that you don’t expect to be handed favors or want them to ask their boss to hire you; however, if your interviewee provides you with some helpful opportunities, there’s nothing to say that you can’t seize the moment! While it might be tempting to cherry pick jobs and only apply for one or two dream jobs here or there, it’s a good idea to apply to a vast number of jobs that somewhat fit your job experience and skills. While you don’t want to be way off base—if you’re an English major, you probably won’t enjoy or be qualified to work in a science lab—there’s a good chance that you might enjoy a job that didn’t quite fit the bill for you on paper. 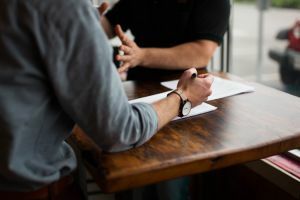 The great part about interviews is that you’re not the only one being interviewed—you’re also checking out the workplace and seeing if the culture is a good fit for you. Don’t be afraid to ask your interviewers questions about their team and how it all functions. It’s better to get your foot in the door via an application to a position you think you could probably handle than writing off jobs at first glance.